We already had a detailed discussion about VCAP6 - DCV Design exam in our last post related to this series, where we discussed about the Path we need to follow and what are the objectives that we need to take care. Let's Start with the very First Objective Create a vSphere Conceptual Design and let's see what are the various sub objectives within each of these objectives that we need to consider. Utilize Inventory and Assessment Data from a current environment to define a baseline state. Determine Customer priorities for defined objectives. Ensure that Availability, Manageability, Performance, Recoverability and Security (AMPRS) considerations are applied during the requirements gathering process. Given results of the requirements gathering process, identify requirements for a conceptual design. Let's Start with VMware Virtualization Case Studies here we discuss about more than 460 VMware Customer Success Stories which gives us an insight about what were the business requirements for the those customer and what were the challenges they were facing and how VMware helped them to achieve the Desired Results. Let's take one example from these 460 success stories about Capgemini wherein they were looking for cost efficiencies made possible by cloud-based service offerings. They also want service levels that are not typically offered by public cloud providers. Being a Pioneer in SAP Capgemini evaluated lot of options including both the Open Source and proprietary Hypervisors again the Criteria used for the Evaluation includes lot of Technical and Non - Technical Considerations Cost being one of another Factor. VMware Helped them to achieve the same with VMware vSphere 5 and Virtualizing SAP and their ERP Systems as an end result Capgemini built a new, cloudbased managed services platform using VMware vSphere technology. Some of the Business Benefits achieved with this Design approach includes reduced Capitalization cost, more rigorous SLA were Met without additional cost. Functional vs Non Functional Requirements. Functional Requirements talks about the specific requirement about what the System should do for example A customer is looking for you to Design a Solution in which he is looking for Administrative functions wherein his Network Admins should be able to monitor the Network Traffic of Different Systems. Another Example about Functional requirement is that he want that the Solution should scale by 20 percent over Next 2 Year this is also a Functional Requirement. What about the Non Functional Requirement well as the name suggests Non Functional Requirement talks about the requirement about How the System should behave, yes you understood it Right the system behaviour or in another words the Quality of the System. VMware vSphere Design Qualifiers which i dedicated to understand design principles and also the Design Qualifiers we need to consider when working towards the Design Goals. Conceptual Design Captures the high level requirements including both the Application and Business Requirements and also the data collected from the Capacity Planning tools, means the current state Analysis report for the Environment. Constraints are not the Limitation or the issues with the enviornment however it's the boundaries within which the Design should be laid, one common example of constraints is Budget restrictions. Risks as the name itself says are the factors that affect the Design and we need to properly document the Risks and also the Severity associated with those Risks. Assumptions talks about the conditions throughout the Design which are believed to be true for example while working with the Design Phase we assume that Client would provide the Storage needed for this Design. Logical Design talks about the Design Decisions on how to arrange the Infrastructure Components (Management, Clusters, Networking, Security, Virtual Machines ) so as it is properly align with the Business and the Application requirements. While creating a Logical Design it is very important to document each Design Decision, Justifications and also the Implications associated with the same. It's time for us to drill it down further and think about proceeding further, those who are reading this have already estimated that in both the Conceptual and Logical Design we did not included anything related to Physical Hardware Specifications and Software Configuration settings well the reason is quite obvious because all these specifications are part of Physical Design. 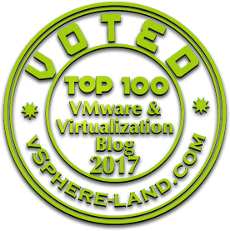 Virtualize Business Critical Applications is VMware Blog written by Mohan Potheri is VCDX#98 and has more than 20 years in IT infrastructure, with in depth experience on VMWARE virtualization. He currently focuses on evangelization of "Business Critical Applications (BCA)" and "Big Data” Virtualization on vSphere. In his Blog he talks about the Critical Factors which need to be considered when Virtualizing Business Critical Application and Focusses on Factors like Availability, Performance, Scalability, Performance, Supportability, Agility.